Like all Mainstream Pokemon Games, there are a number of Pokemon you can receive as gifts throughout your journey in this game as well. The fourth Gift Pokemon you will have the chance to obtain is none other than Charmander, one of the original Kanto Region Starter Pokemon. At the very top of Route 24 found north of Cerulean City, you will find a trainer who doesn't feel they are strong enough as a trainer to raise Charamnder. If you have captured over fifty Pokemon, he will believe you are good enough of a trainer to take care of Charmander and thus will offer it to you. 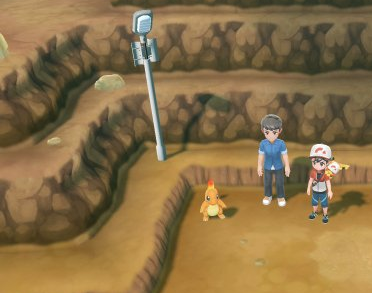 Outside of being a Rare Spawn on Routes 3 and 4 and within Rock Tunnel, this is the only other way of obtaining Charmander within the game.